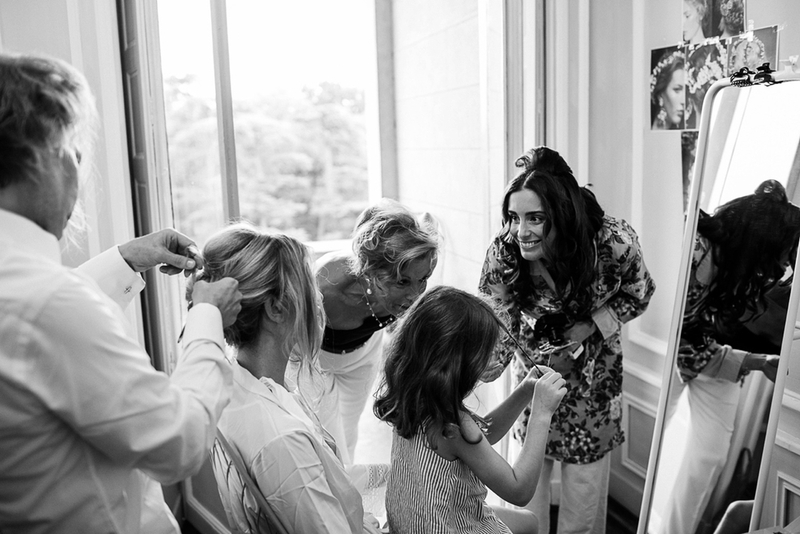 The wedding celebrations of Marie-Isabel and Nicolas at Chateau Bourdaisiere near Nimes, France. Beautiful from start to finish with every detail so well thought out with nods to Marie-Isabel's parent's wedding - Marie Isabel's dress was modelled on the dress her mother wore nearly 30 years previously. My clients find me in the most unusual way. Marie Isabel's sister spotted me photographing a couple in London while they were preparing for her wedding and happened to be with a friend of mine at the time who gave her my details. This was a spectacular wedding on all counts. The celebrations started with a party on the Friday night at the historical riverside Chenonceau and after only a few hours sleep the bridal party were preparing for the morning ceremony at a local church. In true French style guests were then free to sleep off the previous night before gathering again for the evening celebrations at the Chateau with the amazing Earth Lights Boogie Band playing until the yearly hours.